With more than 400 years of wine tradition in our family, our small, artisan “negociant” winery, J. 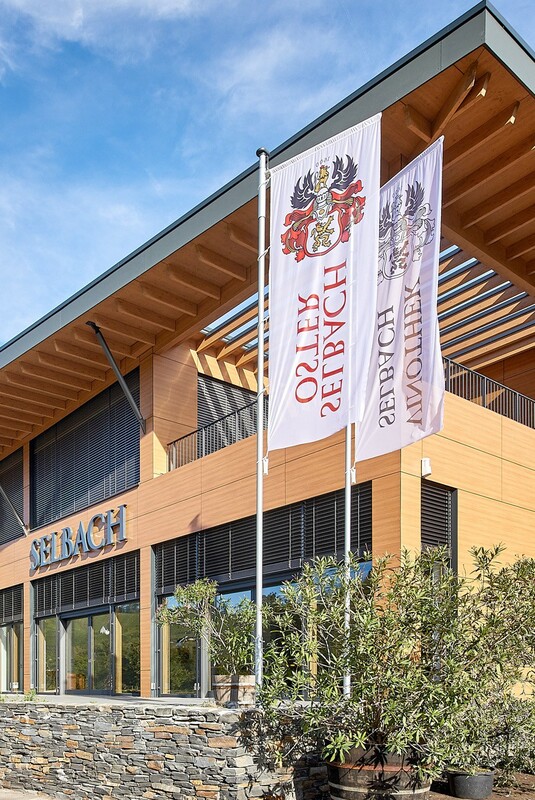 & H. Selbach, and our” domaine” Weingut Selbach-Oster, bring us a broad spectrum of high-quality wines every year. Wines that can be experienced in our new tasting room, Vinothek Selbach. Our new tasting room is a place to feel like being at home. It was built using high-quality, environmentally friendly materials, most of it native wood, eco-friendly and sustainable. A broad selection of excellent wines is presented in aesthetically beautiful and functional premises that invite you to enjoy everything “Wine”. Tasting, learning and experiencing wine, buying wine, business meetings, parties, family celebrations, stylish receptions - Vinothek Selbach offers many possibilities for everybody who is interested in wine, be it individually or in groups. The experience of a visit is enhanced by the stylish settings of the building in conjunction with grand panoramic views across the river onto the breathtaking, steep slopes of the Ürziger Würzgarten, which seem only a stone‘s throw away. (on Sundays and public holidays by appointment only). Parking is available next to the tasting room. Water and bread are served at the tastings. We are happy to offer wine tastings for smaller groups at a flat rate ( the minimum charge is 60 Euros ) as well as custom-tailored tastings for individual preferences. Our seminar room is equipped with multi-media and offers seating for up to 28 people. Larger events (or events on weekends) can be negotiated individually. Pricing upon request. We are happy to provide you with catering recommendations and offer you our fully equipped, professional kitchen for the chef your choice. We are looking forward to your call, your email and your visit.